The 2014 edition of the Berlin Festival is about to take place in September. From 5. 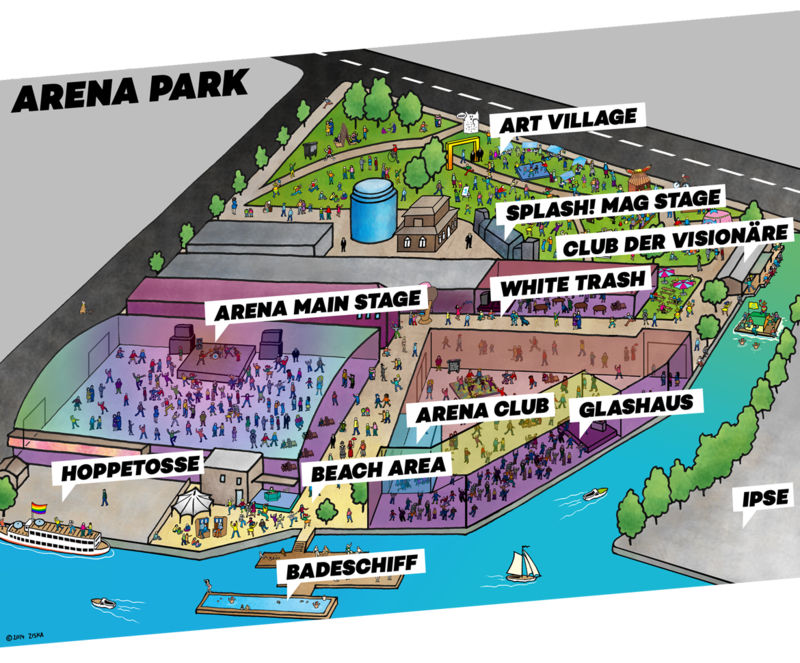 – 7.9.2014 the new location at the Arena Park will be the musical hotspot of Berlin. After a few years on the Airport Tempelhof 2014 the Berlin Festival moves over to the Arena Park right on the river Spree at the border of Kreuzberg Friedrichshain and Treptow. 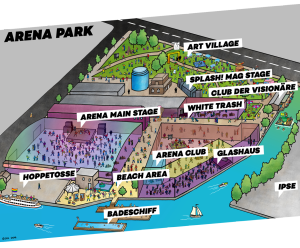 This area is allready know for clubs like the Watergate, Club der Visionäre, Arena Club, Hoppetosse, Chalet, Ipse or Else. What better place could they find for a Berlin Festival right in the heard of Berlin’s night life. The line up will be a more or less typical Club line up. Digitalism, Dieter Meier of Yello, Hudsom Mohawke, Rustie or a DJ set by Jazzanova will prove that. Also the setting will be a little bit different this year more like a club than one big festival stage. Clubs/Stages like the Badeschiff, White Trash, Club der Visionäre, Glashaus, Arena Club are names many know already when it comes to Berlin’s night life. But of course they still have 2 big stages. One main stage inside the Arena and one Splash! Mag outdoor stage at the Arena Park where also the Art Village found its new home. For these main stages there is of course a huge Festival line up with some very interesting headlines like Darkside, Dj Koze, Ellen Allien, Bombay Bicycle Club, The Editors, Zoot Woman, Crystal Fighters, Woodkid, Moderat or Berlin’s best: K.I.Z. This entry was posted in Event and tagged Arena Berlin, Berlin Festival, Outdoor by U inn Berlin Hostel. Bookmark the permalink.